Trading opportunities on the currency pair: Since dropping to 1.1662, the rate has formed an inverse head and shoulders model on the daily and weekly timeframes. For its completion, the right shoulder needs to form with a target of around 1.1880 by 23/10/17. By the end of October, downwards movement should resume. Therefore, from 1.1880, we can start betting on the rate to decline. It seems to me that ideally, this reversal model won’t work out. Trade carefully. The last idea to come out on the EURUSD currency pair was on the 10th of July, 2017. At the time of writing, the euro was trading at 1.14 USD. From there, I was expecting a rebound from the upper boundaries of the A-A and C-C channels. I used the zone from 1.1475 to 1.1595 to sell euros with targets of 1.12 and 1.0925. Things didn’t turn out as I expected. Buyers shifted all resistance levels and the price didn’t even stop. In mid-July, the price exited the C-C channel. Within 4 weeks, the euro reached 1.1910. At the beginning of September, the price hit 1.2092. This rally resumed as a result of weak US data, a reduction in Treasury bond yields, and talk about curtailing the ECB’s stimulus program. The euro bulls eventually ran out of steam at around 1.2092. After breaking through the TR2 trend line, or the lower boundary of the D-D channel, they started to take profit on their long positions. The bullish trend lasted for 28 weeks. Then, in the space of a week, the euro dropped 54 pips to 1.1734 against a low of 1.1669. On Friday the 6th of October, the euro closed up. Buyers managed to recover the losses incurred by the NFP report and the announcement that North Korea plans to test another missile, which could reach the US’s western coast. The weekend went by peacefully. On Friday, the price dropped to August’s low of 1.1662. Due to the fact that the growth from 1.1662 to 1.2092 was quickly reversed, we’ve got an inverse head and shoulders model forming on the daily and weekly timeframes. For this model to complete its formation, the right shoulder needs to form with a target of around 1.1880 by 23/10/17. I got this date based on an analysis of the daily timeframe. Downwards movement should resume by the end of October. At this stage, I can’t see the price dropping below the neckline. Here, we need to see whether or not buyers can consolidate the price above 1.1800 before Thursday. The more traders who notice a head and shoulders model, the less likely it is to be realised. If buyers meet resistance at 1.1760, there’s an increased risk of the price dropping to 1.16 or the upper boundary of the C-C channel. A return to the C-C channel would tip the balance in favour of the bears. 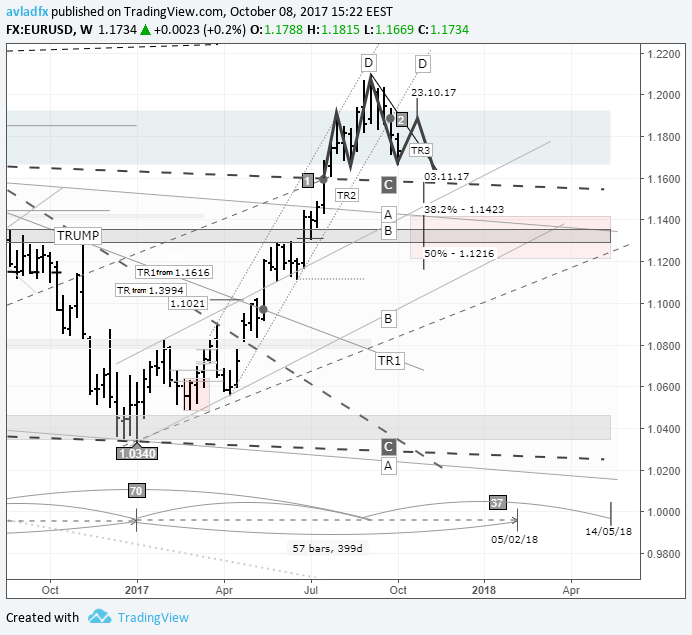 In such a case, buyers may have to retreat as far as 1.13/1.1350. If sellers don’t manage to bring the euro down to 1.1560 by 12/11/17, the rally should resume until 14/05/18.